Probably the sleekest bottle label ever. In the heel of Italy’s boot there is Puglia. In Puglia there is Salice Salentino. That is where this particular wine is made, with 100% negroamaro grapes. 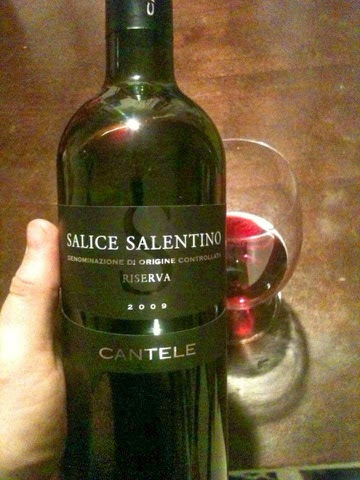 Cantele’s Riserva is brick colored and medium bodied with modest tannin and high acidity. The nose carries aromas of mint, black licorice and cherries. There’s snappy cranberries and a bit of raisin on the palate, with a savory mouth-watering finish bursting of bing cherries and a hint of rosemary. The high acidity, common in Italian reds, makes this a great food wine. Particularly with cured meats and pasta. However you can also drink this all by itself; something I simply cannot do with some other Italian reds, such as Chianti, where food is needed. I especially recommend this wine to Zin-lovers as it’s almost like a different spin on zinfandel. I also highly recommend it to Zin-haters for the exact same reason. This would probably the favourite post for any wine lover. The way you defined its specification is too good and I think now non drinker will also get attracted after your description.